Mike Brewer's post today on his Property Management blog inspired me to run through some of the other energy management options available on the market today. The Home Joule (pictured) is a slick little device that ConsumerPowerline is offering in the New York area. It analyzes energy price data from the utility company and usage data for each user, then provides a display to the user that changes color and provides other indicators that help determine if energy consumption needs to be adjusted. It all operates on a pager network. Just as messages to specific pagers go only to those users, so do the energy signals find their way to the right Joules. Companies like Control4, HAI, Honeywell and others have thermostats that are not only programmable, but accessible via the Internet. That means they can be programmed and monitored from the leasing center or a corporate office, which could come in handy for vacant units. The ability to set temperature ranges -- and email/text alerts when things aren't as they should be -- could be a huge benefit for apartment operations teams. Most of these devices cost significantly more than regular programmable thermostats, which has prevented them from taking off in the multifamily industry. For example the cheapest I could find online for one of the Cent-a-Meters that Mike covered was $152 each. However, as the price of energy rises and the prices of electronics continue to fall, these types of solutions will surely continue to gain traction. There's a real ROI case to be made here, not to mention a resident-empowering "be green... take control of your energy" message that marketers could certainly run with. Do you have other energy control solutions that you're using in your community? Do prospects respond well to them? Do residents actually use them? What would it take for you to switch to a more manageable solution like this? Thanks for getting the conversation started, Mike! Poll: Would You Use a Multifamily Technology Network? The Multifamily Technology Group on LinkedIn is growing fast, but there really is no good way for group members to communicate with each other to get questions answered or opinions about new technologies. Let's get the conversation started! In addition to Wikipedia articles, Google Maps have now added photos through one of Google's photo sites, Panoramio. On Google Maps, you’ll see there is now a “More” button next to “Street View”" and “Traffic.” If you click on it after getting a map, you will be given the options to select “Photos” or “Wikipedia.” Checking the first option populates the map with geotagged photos provided by Panoramio. The second gives you geocoded Wikipedia articles. I searched a few cities... In Orlando, I didn't find any apartments communities, although I found entries for a Marriott, a local community college and other landmarks. The more that Google can populate maps with data like this, the more useful they become. Another example is the relatively new feature that enables you to edit the details of your business listing, and you can even "claim your business" to provide even more information including images, website links and coupons. I’d really like to see geotagged Flickr photos as an option -- Flickr is a much more popular photo sharing site than Panoramio. As TechCrunch suggests, Yelp reviews would also be cool. How can apartment marketers use features like this to promote your community? Maybe a photo contest that asks residents to submit and vote on unique photos from around the property or the neighborhood... What else can apartment marketers do? 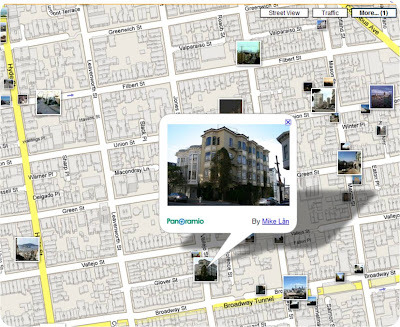 What other useful features could Google add to make their maps to help you promote your business? Location is everything in the multifamily business. So doesn't it stand to reason that as many details as possible should take location into consideration, even while the property is being designed? Let's look at an example of what I mean by this. Below is a building in design that will be built on the New Jersey waterfront, featuring beautiful views of the Manhattan skyline for the community's residents. The property owner realized very early during the design that they wanted this view to be the focal point of as many units as possible. While the focal point of each unit changes, there are still only a small number of floorplan layouts. This means that two residents living in the same floorplan on opposite sides of the building (North and South in this case) will likely orient their furniture in different ways to take advantage of the best view afforded by their particular unit's location. Now let's consider the units on the opposite side of the building -- the side that offers the premium views of the waterfront and skyline. As you can see, the units are located on both the North and South sides of the building, so the units will feature varying views based on the specific locations throughout the building. It's a subtle difference, but without it, residents might be frustrated by misplaced outlet locations that don't consider the context of the surroundings. With some new mapping and modeling tools, designers are able to determine the approximate view from any unit in a residential building. The low-powered way to do it yourself is to use the 3D features in tools like Microsoft Virtual Earth or Google Earth. This specific example obviously may not be a concern in many communities, but small details like this will likely save more than a few residents' headaches, regardless of your property's address. How else are you using your property's technologies to complement the community surroundings?